The April 2016 issue of the Newsletter of the Alaska Entomological Society is available via the link below. The article appeared in Alaska Dispatch News on April 3. The article appeared yesterday in The Journal of Research on the Lepidoptera. Zaz Hollander wrote a nice article (URI below) for the Alaska Dispatch News on Ken Philip and his newly available book, Butterflies of Alaska, A Field Guide. 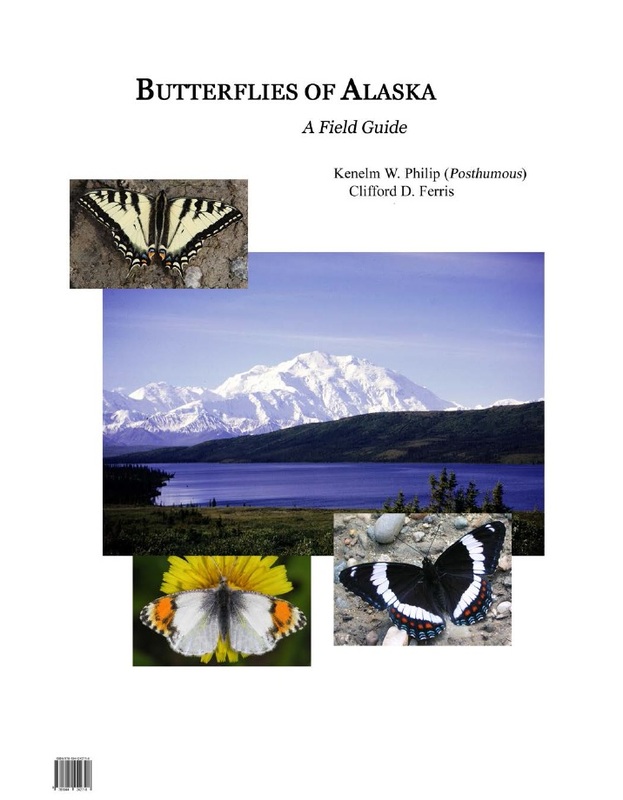 Butterflies of Alaska, A Field Guide will soon be available for purchase. Details are available at the URI below. 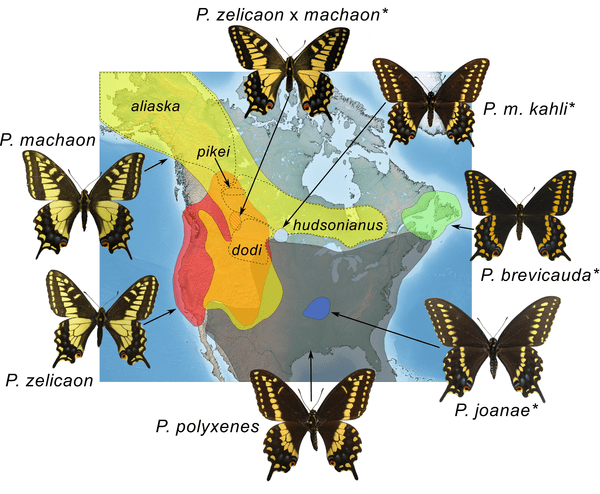 Generalized range map of current distributions of the Papilio machaon species complex in North America. The article appeared in the journal PLOS ONE on October 30. Topics included new exotic species, mosquitoes, pollinators, carpenter ants, etc. This is a nicely written and very informative article on the importance of collecting. 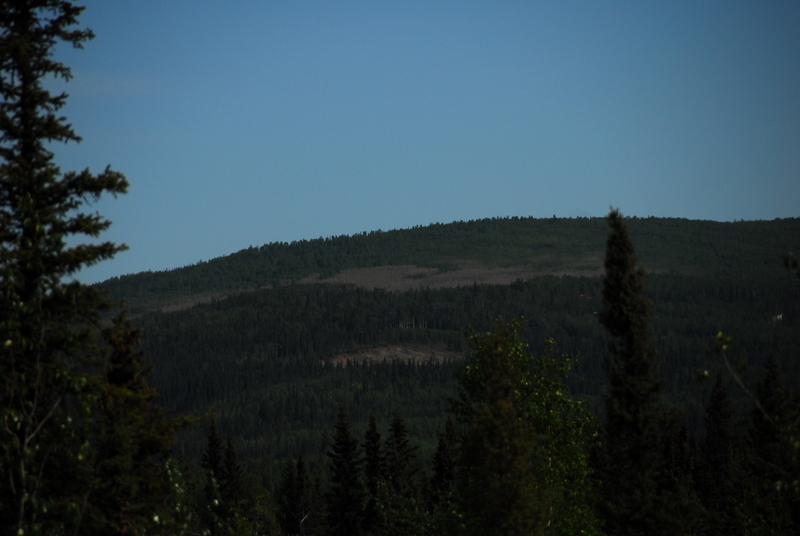 A large stand of defoliated aspen visible from across the valley. 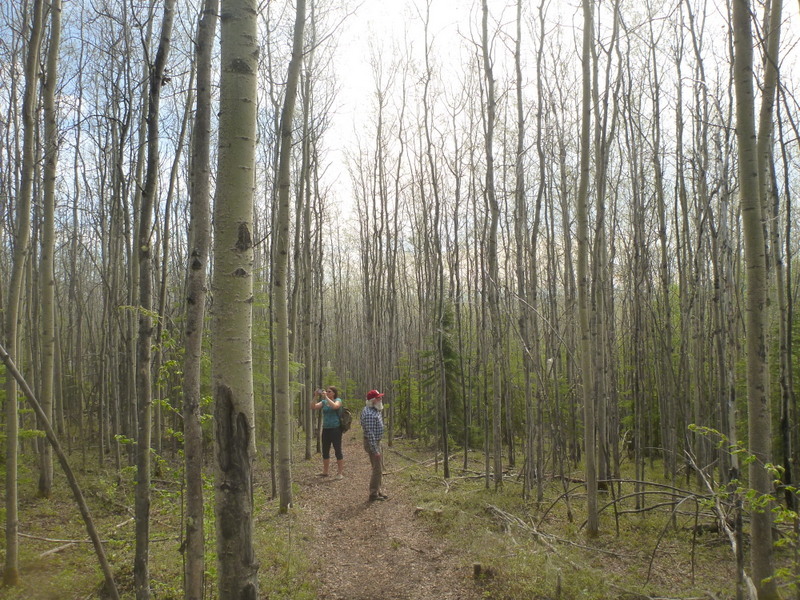 In the last two weeks there have been numerous reports of aspen defoliation in the Goldstream Valley on the north side of Fairbanks. An area approximately 50 acres in size has been heavily defoliated by the caterpillar, large aspen tortrix (Choristoneura conflictana (Walker)). Brief, intense outbreaks are common throughout the range of aspen, and typically last 2-3 years before collapsing. These outbreaks can grow to cover thousands of acres. The larvae tie together leaves with webbing and feed on the plant tissue. They will web other species of plants and feed on them if they run out of available aspen foliage. Although the forest can look very grim, leafless and covered in webbing, the trees will often create a second flush of leaves later in the summer. Historically there has been little long-term damage to the aspen trees associated with past outbreaks. The aspen were completely defoliated shortly after bud break by the large aspen tortrix. 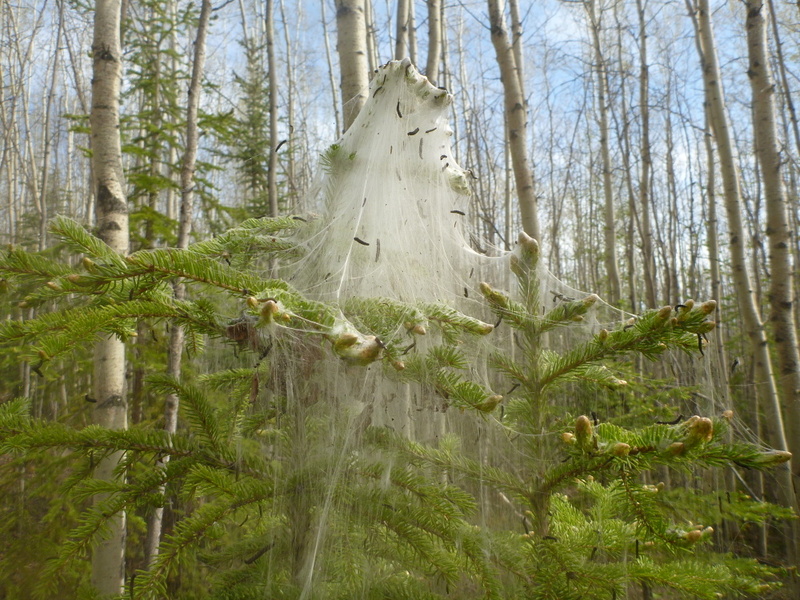 With few aspen leaves left to feed on, the larvae have been descending from the canopy and webbing understory vegetation to feed upon, including spruce, alder, birch, and roses.